We’re delighted to announce a new product integration. This time we’ve partnered with Looker to combine Piwik PRO data with high-quality business intelligence. Read on to see what this new integration brings. Every business operating online needs a way to analyze and measure its digital presence. The answer to those needs are marketing tools. They help you track the activities of your users so you can understand precisely what brings visitors to your page and what makes them leave, which actions they perform, and how much time it takes to accomplish specific tasks. All the collected data can be used to tweak your website or app, making you more engaging for your customers. And that’s just a taste of the vast list of functionalities MarTech tools have up their sleeves. 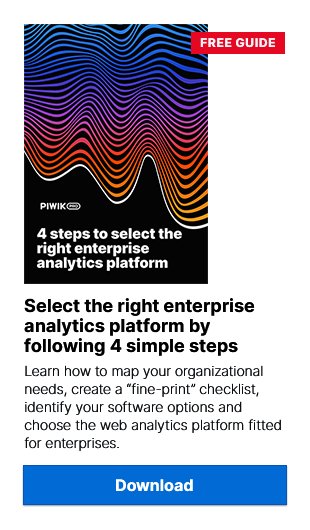 In the case of the Piwik PRO Analytics Suite, available both in the cloud and on-premises, you also retain total control over your data. This means you can freely apply desired security measures and guard your data in a way that’s consistent with your internal privacy policies and international regulations. At the same time, you still get all the valuable insights provided by web analytics. This approach to data privacy has made Piwik PRO the tool of choice for many organizations that demand higher data security standards. That’s why our portfolio of clients includes such respected institutions as Accenture, the Government of Canada, and the European Commission. That said, we know that integrations with different products help us to provide users with access to even more versatile marketing technologies and – what’s even more important – make their everyday work much easier. That’s why we decided to team up with Looker, a uniquely powerful business intelligence platform harnessing the power of SQL, to help companies get real value from their data. This integration will help our users make more out of their data without requiring advanced technical knowledge from them. Many marketing campaigns require instant access to web analytics reports. Now you can have this with your Piwik PRO reports. The Looker integration means you’ll be able to track user flow in real-time. The combination of Looker and Piwik PRO automatically gives you all the desired data right away, without waiting around for archival. By taking advantage of our new integration you’ll free yourself from limits on the number of metrics you can track. Looker’s capabilities allow you to create and share visualizations that give exhaustive overviews of what’s happening on your website. The integration lets users take advantage of custom reporting even when they are not fluent in technical aspects of analytics. Beyond this, experienced analysts can squeeze even more out of their data by creating more granular reports and sharing them with the whole team. Sounds interesting? Try it out! We hope that the use cases described above give you a sense of how much you stand to gain from the integration of Piwik PRO web analytics insights and the business intelligence delivered by Looker. If you’re interested in combining the functionalities of these two awesome tools, or if you just have some additional questions about them, we encourage you to contact us. We’ll be happy to help you out!